First select whether you are listing a shop, an installer or you are adding an event. Then select whether you are going to add a free listing, featured or premium, you can find out what features you get with each package here. Free listings include many useful options, however featured and premium packages will offer much more. Next declare whether you are the business owner, employee or a third party, you could have simply bought from a showroom and would like to list them. 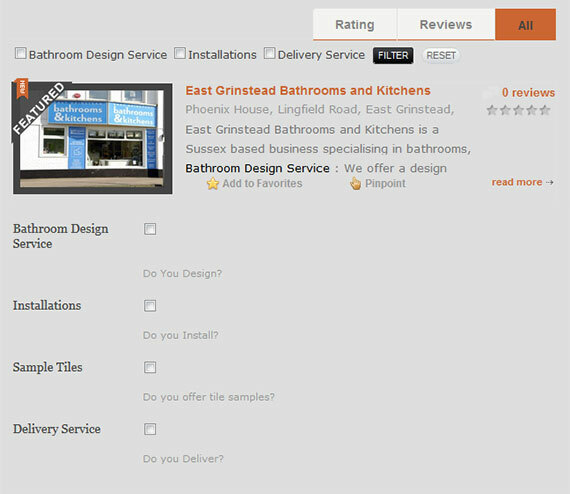 Within the listing title it is good practice to also include the town that the business is located in, for instance “Best Bathrooms Hampstead”. Drop down the select city box and choose the closest postal town, i.e the first two digits from your postcode, If you are in Falmouth, Cornwall you would use Truro (TR) as your postcode starts with TR. Once you have finished typing in your address you can press the ‘SET ADDRESS ON MAP’ button, don’t worry if it fails, it is using Google to geolocate the address, just drag the map POI (point of interest marker) to the correct position. 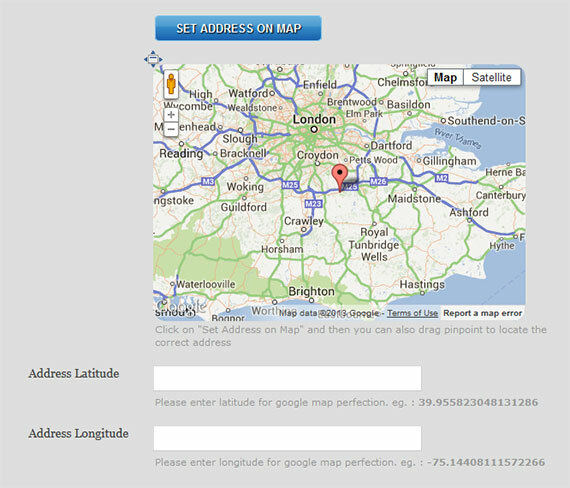 The Address latitude and longitude will automatically get filled in. Please be precise with the marker as this will help your customers find you. If you are an Installer you still need to use this section, It makes perspective clients feel comfortable that they know your address. We will not list any installers if an address is not completed. Make sure you write a fairly detailed description. Descriptions specify how your listing will appear in search engines. See below. When writing your description remember this is what your customers will make their decision on, sell your services. Make sure you don’t make spelling or grammatical mistakes as this will not make a good impression. Also the manufacturers you deal with How long have you been a trades-person? What is your specialism Are you insured? Do you have parking facilities Your standard of work. Bathroom Home Directory offers discounts as listed by showrooms and installers. Consider listing a special offer on your page as this is attractive to customers on a budget. Special offers are a great way to attract customers, if used correctly. Discounts to Bathroom Home Users, for example – all customers who found their listing Bathroom Home Directory will receive a 5% discount. When using the special offers feature as a premium member, remember to update your offers often to attract a wider market and to keep your listing page looking fresh and updated. We do not recommend using using specific dates for expiry or limits, this will only increase the management required for your listing. This is what a special offer will look like on your listing page. Opening times should be displayed simply, for example – Mon-Fri 9 – 5pm Sat 10-4pm… Exceptions should be displayed as descriptive footnotes not as standard opening times, ie. Thursday’s we open until 8pm. This will improve the usability of your listing for its users and promote a standard format across Bathroom Home listings. If you do have a website it is important that you upgrade so you can include direct links. Linking to your website from a high quality website like bathroom home, packed full of key words and relevant content, will help your SURPS (search engine results page) and be a sure fired way to boost your position in search engines such as GOOGLE. Interact with your customers by adding social network; Facebook, twitter and other networks are a brilliant way of interacting with customers, this is an essential way to promote your business. Remember also to share your listing on Facebook, Twitter and Google+ ask your friends and customers to share and like your listing. This will both boost your SEO and make customers feel more confident in your business. Contact details are essential to a listing. Allot of customers like to contact showrooms prior to arrival and will favor a showroom they have had communications with. It is even more essential if you are an installer. Type in your phone number and email address. If you are using a land-line number ensure to provide an area code. Your email address will be private and not displayed on your page, instead it will appear as ‘inquiry’ prompting customers to fill out a form in order to contact you via email. Selecting services allows users to filter out the results, to help them find what they are looking for. In order to ensure that users reach the right listing and to prevent them from requesting services you don’t provide make sure you select your services accurately. Key words must be specified for every listing. Key words add weight to your listing, when customers search our website and also when they use search engines, these words will effect the indexing of your page. These key words will make a difference to the traffic that reaches your listing. All listings must have at least one image, this is important to maintain consistency throughout the directory and to make each listing look good. Images also help improve your page SEO. We recommend using an image size of 600px x 400px. Using an image of a shopfront or logo would be most suitable for the 1 image available for a free listing, however premium and featured listing could also include images of products and your showroom. If you do not have an image available at that size and do not have the ability to alter the image yourself send us your image and we will edit the image for you, alternatively use your company logo. Multiple images will be displayed as both a gallery and a slideshow which will liven up your page. Videos are are great way to liven up your listing, if you do not already have one consider creating a short promotional video clip. Videos are added to listings by copying an embed code from online videos and pasting it into video code section in ‘add listing’. If you have a website you should include a Bathroom Badge on one or more of the pages. This will link to your listing. Use Bathroom Home Badges on your website. If you have a website make sure you have inserted at least one Bathroom Home Badge. Badges link directly to your listing and allow your customers to review and rate you. Also having multiple references available to customers looking at your website will give them confidence in your business.